Facebook’s Blueprint training programme is a free tool which allows you to get to grips with basically the whole ad side of Facebook. Here are 5 things that I’ve taken from it whilst brushing up on my social advertising skills. A point on the creative side of Facebook advertising: Stories are 22x more likely to be remembered than facts. In hindsight, I should’ve made this a story. Remember, that at the basic level of advertising, you’re telling a story of why or how this product/service will make their life easier/better. With Facebook, optimisation is an ongoing process that is necessary for success. 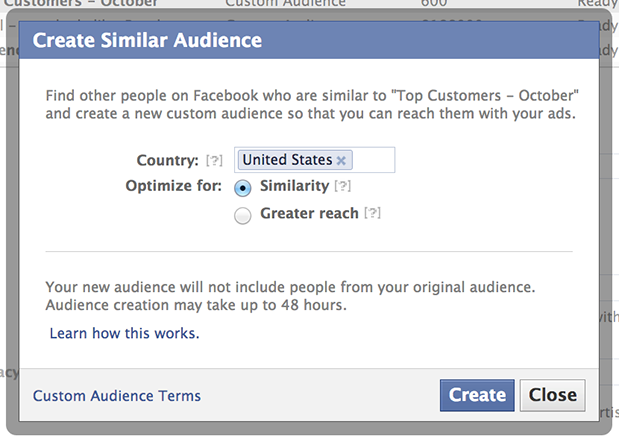 Facebook differs from Google where you can set-up your ad, test, fine-tune, and then can leave it. Google = Serving Demand. You ads are served to people searching for something specific to buy (warm leads). Facebook = Demand Production. Your ads are served to those who meet specific targeting criteria, allowing them to discover your product, and then possibly buy. But with Facebook, you need to set-up, test, fine-tune, then repeat continually, honing ads to get it right. You need to test the ad creative — the headlines, body copy, images — as well as the targeted audience. It’s fairly common knowledge that Facebook serves you with ads based on your Facebook data like age, education, likes (Core Audiences/Partner Categories), or if you’d purchased something using your Facebook account email, then that company could upload your email and serve you with ads (Custom Audiences). Their Lookalike Audiences are really impressive though. Simply put, you can grow your fanbase or drive conversions by reaching people who simply look like existing fans. You can even specify if you want the similarity to be really close or quite broad. By now, most people understand that likes aren’t the be-all and end-all of social media. Facebook have gone one further, and said we must look beyond the click as a measure; Nielsen found no correlation between CTR and ROI. Click-attribution makes sense for things like SEM, but with display ads, what you can find is there bears little resemblance between clicks and $. Of course, people clicking should tell you the largest group of willing donators, however simply seeing it in-feed is enough for certain demographics (in this case, males 35-54) to take action. Something for marketers to think over when measuring direct response ads – Clicking is great, but if they’re not taking the action then it’s not really that important. The photo-sharing app has been under Facebook’s ownership for a while now, and when you’re ready to send out your amazing Instagram ad campaigns, Facebook’s Power Editor will have to be your friend. That is of course, unless you’re in the fortunate position of having a Facebook Marketing Partner, or enough of a budget to have your own Facebook Sales Representative that you can create an Insertion Order with, however for the majority of us, Power Editor is what we’ll need. Basically Instagram ads will very much work off the huge amount of data you’ve (voluntarily) placed on Facebook, and you’ve made it even easier for them when you linked your Facebook account to your profile in order to show your Facebook friends that amazing dinner you had. Note for example, carousel ads are solely the domain of Insertion Orders, whilst lowly App Install Ads (the majority of which I’m getting bombarded with already). Instagram’s Marquee Ad (not pictured) will also only be available via IO. So here are my 5 things you might not know about Facebook advertising! At the very least, I hope you now have a bit more of an understanding surrounding how Facebook’s paid side works, because it’s becoming more and more necessary to pay to have any sort of big impact on social. Want to learn more about Facebook Marketing? Velocity is running a Facebook Marketing Course which will cover both organic and paid activity. For more information, click here.